Front-line treatment technology enables the removal of the excess under-eye fat-pad, without any swelling and downtime. 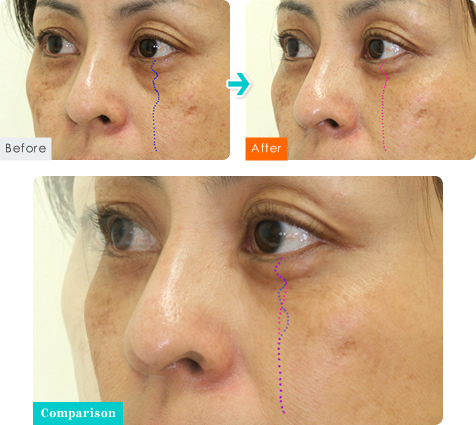 By using a high frequency wave surgical laser, the treatment is possible without bleeding and visible scars. The collected fat pad is processed to maximize fat cell survival and injected into the under eye area to fine-tune the curves. If a patient has large dents and the removed fat pad is not enough to fill them, a small amount of fat will be collected from the thigh or the abdominal area to inject into the dents. Degreasing (Transconjunctival Blepharoplasty) and lipo transfer, along with fat injection if needed, can create more natural S-shaped curves. If a patient has dark shadows due to the dents between the under-eye area and the cheek, then additional fat may be injected to make smooth and natural S-shaped curves. Only in such cases, we collect as little as 10cc of fat from the patient’s thigh or abdominal area. Degreasing and lipo transfer basically improves various types of eye bags. And, adding fat injection leads to a better outcome. At Theory Clinic, we choose the most suitable treatment method to match each patient’s symptoms and needs. The puffiness under her eyes was caused by the orbital fat pad inflation. This patient had dark shadows between the bags and the cheeks. We needed to inject substantial amount of fat to flatten the gap. Puffiness under the eyes is gone. The shadows have disappeared and it looks as though her cheeks have been lifted up. 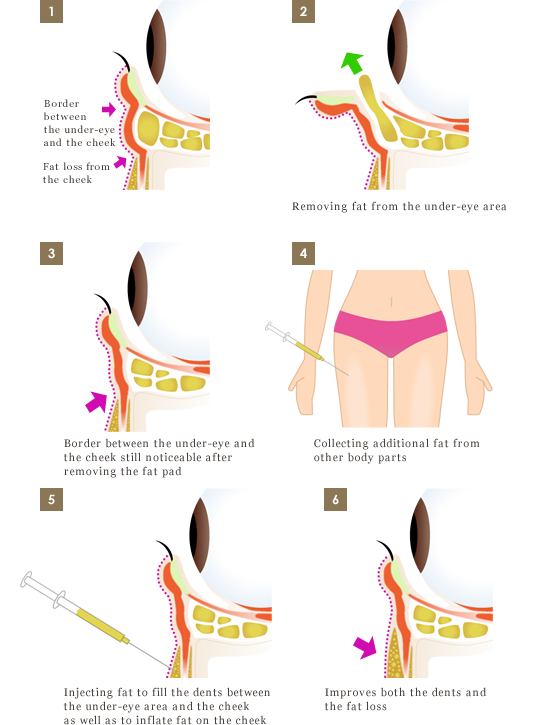 We injected fat from one spot on each side of the cheeks. Compared to the under-eye area before treatment,the area now looks a little swollen. This swelling would go away in a few days. At this stage, fine-tuning can be done. If swelling occurs right after the treatment,fine-tuning has to be postponed till after the swelling goes away. No-swelling treatment saves time and reduces burden on patients. This patient received degreasing from another clinic. the fat pad inflation recurred in a few years. 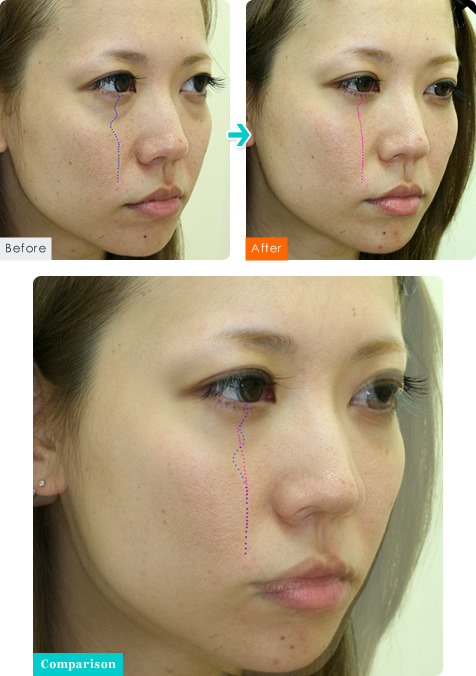 lipo transfer method to prevent the under-eye area from getting dented. he puffiness under her eyes is caused by the orbital fat pad inflation. If the fat removal is insufficient, the inflation will recur in a few years. Red eye bags are also improved. we recommend treatment by a degreasing specialist. Varies from patient to patient. Not required If necessary, doctor will examine free of charge. Suture removal from the site where fat has collected is not necessary. You can wash your face on the same day. however, wait for 3 days to wear eye makeup. Wait for a week before wearing contact lenses. Do not rub the treated area. Some mucus may be secreted from your eyes for about a week. In that case, use eye-drops as prescribed by our clinic. do not take bath for a long duration of time for at least a week after the treatment. Why Degreasing alone cannot produce a satisfactory result? Degreasing is a method that reduces the inflated orbital fat pad under the eyes. Theory Clinic’s “Degreasing plus Lipo Transfer” treatment not only reduces the fat pad inflation but also smoothes undesirable bumpy S-shaped curves. Degreasing alone can correct the S-shape curves to a certain degree; however, in most cases, it is difficult to obtain a satisfactory result. A key to success in the S-shaped curve alignment is to remove “the right amount” of the orbital fat pad. Too much removal produces dents and too little removal leaves puffs. The amount of fat that should be removed differs substantially among individuals. It is hard to judge “the right amount” by looks and it is almost impossible to determine it while a patient is lying on an operating table. The amount of fat that should be removed differs substantially between individuals. It is hard to judge “the right amount” by looks and it is almost impossible to determine it while a patient is lying on an operating table. That is why we, at Theory Clinic, use degreasing and lipo transfer in combination for aligning the S-shaped curves. For appointment, contact us by phone or e-mail. Copyright © 2014 Theory Clinic All rights reserved.